V-MODA Crossfade 2 Wireless Over-Ear Headphones Review - What A Surprise! 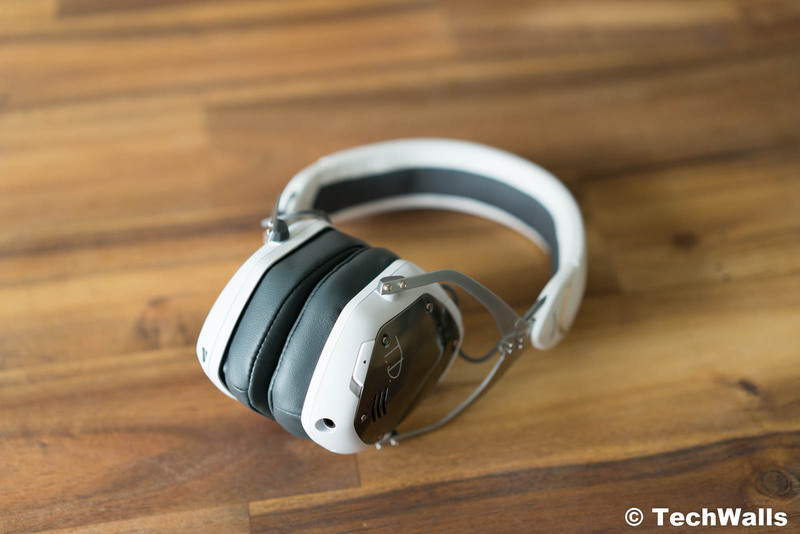 V-MODA Crossfade 2 Wireless Over-Ear Headphones Review – What A Surprise! 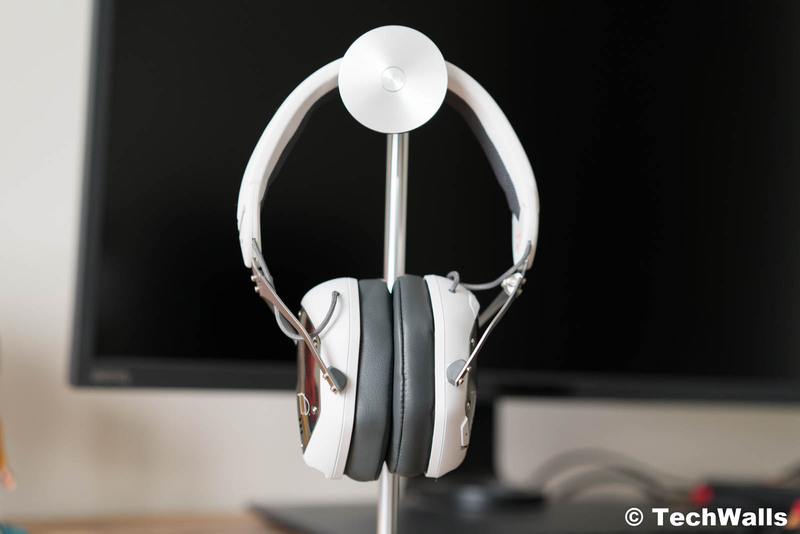 Before testing the new V-MODA headphones, I have reviewed some other headphones from the manufacturer but none of them could stay on my desk for more than a couple of weeks. I had different issues with those headphones, so I was really doubtful when receiving the V-MODA Crossfade 2 wireless over-ear headphones. They are even more expensive and it would be very difficult to justify the price if there is no improvement in the performance. Let’s find out if the V-MODA product deserves its premium price tag. Unboxing the product was pretty much the same experience as seen on other V-MODA headphones. 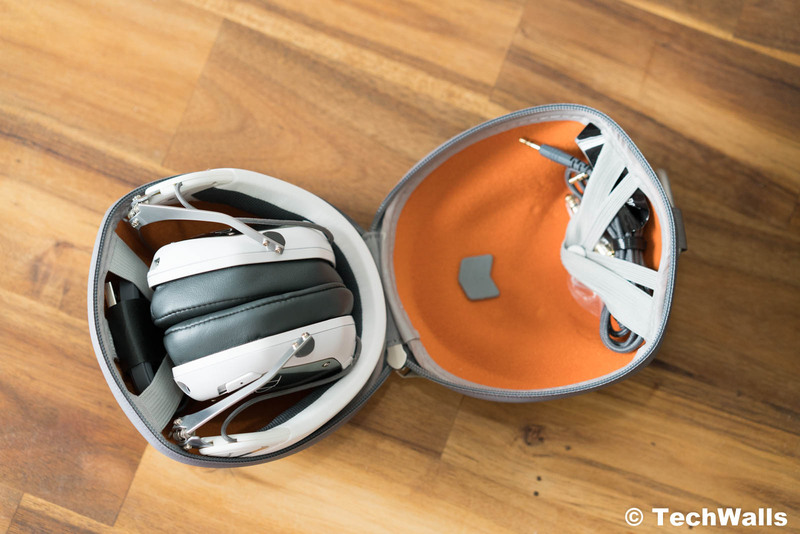 I’m very impressed with the compact exoskeleton case which keeps the headphones and all accessories inside. We can find a USB charging cable, an audio cable with in-line controls, and a 1/4″ gold-plated adapter. As compared to the first version, the whole package is significantly smaller. This is because the new version features the CliqFold Hinge design, this is basically foldable hinges that allow folding the 2 earcups inwards for easier storage and transportation. My review units come in a white matte color and I have my initials laser-engraved on the two shields. These don’t look as stunning as 3D custom shields but it’s still a free option to customize the headphones. You also have an option to engrave a logo or any image on the shields. All ports and connections are placed on the earcups, you can see a 3.5mm audio input, a microUSB port, volume, playback controls, and a switch for powering on/off and Bluetooth pairing. Products in white color often reveal some imperfections in the build but I couldn’t find one on the V-MODA. The build quality of the headphones is truly amazing although the earcups are still made of plastic. I’m very impressed with the steel frame and SteelFlex headband which could be bent flat for over 10 times. Besides, I love the clicking sound when opening or folding down the earcups; the hinges feel very sturdy and they are one of my favorite changes on the Crossfade 2. The headphones are a lot more comfortable for extended listening sessions. All of my previous V-MODA headphones are so tight and hot that I couldn’t wear any of them for more than an hour. The Crossfade 2 is surprisingly comfortable and I no longer feel the pressure around my ears. 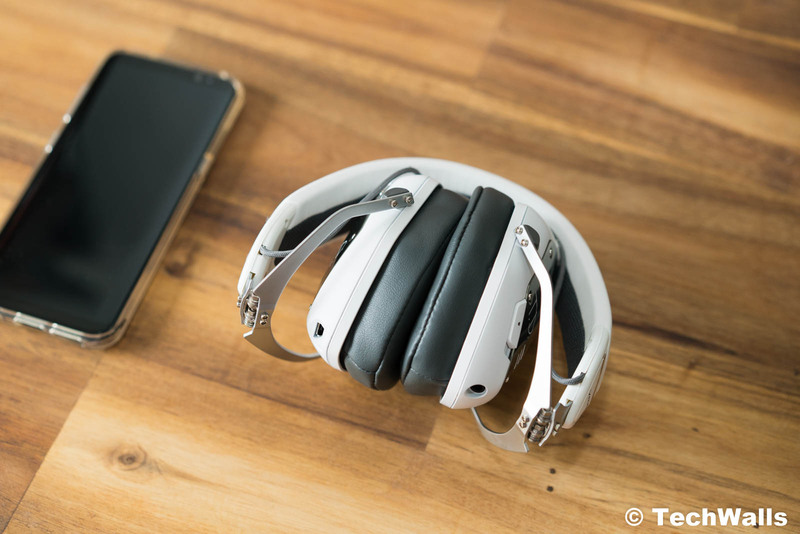 Although they are not as tight, they still isolate ambient noises pretty well and the passive noise cancellation is enough to use on the go. Another improvement of the Crossfade 2 over its predecessor is the battery life. It is equipped with a bigger 430mAh battery which claims to last over 14 hours. I can’t measure the battery life accurately since I use them just about 1-2 hours per day. However, I have no complaint at all since I don’t need to charge the headphones for a few weeks. V-MODA has replaced the old drivers with the re-engineered dual-diaphragm 50mm featuring Japanese CCAW coil 50mm ones. And I’m really glad they did. 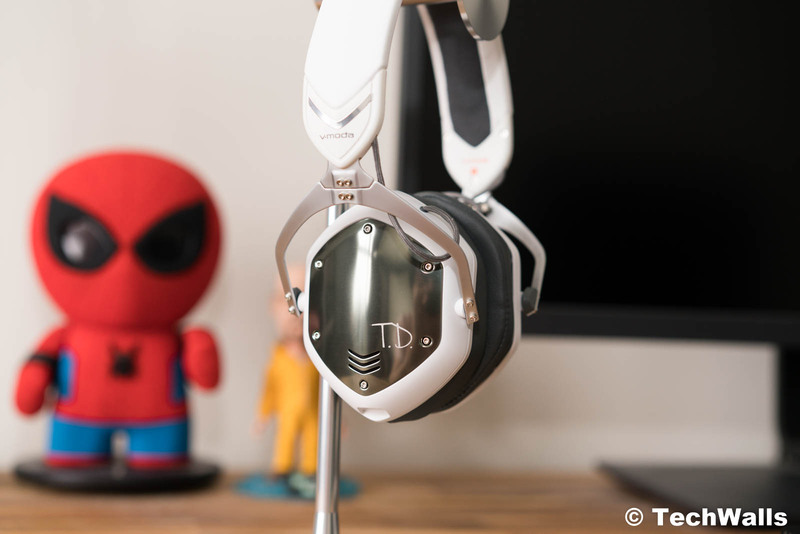 While the original Crossfade sounds too muddy and bassy for my taste, the Crossfade 2’s sound is well-controlled and it doesn’t cause ear fatigue when listening to music. Having said that, it is nowhere near a neutral sound because V-MODA still targets bassheads with the headphones. The bass is still boosted dramatically and can satisfy most people looking for a rich sound and powerful bass. Since these are wireless headphones, I mostly use them in the wireless mode because of the convenience. In case you want a better sound quality, you can use the wired connection as it supports frequencies beyond 40kHz with Hi-Res music sources. If you are just streaming high-quality music from Spotify, Apple Music, or Google Play Music, the Bluetooth connection is more than enough and there wouldn’t be any notable difference. I’m not a fan of the bassy sound, so I gave the headphones to a DJ to check it out. He was so excited when trying the headphones and kept complimenting the deep bass response and excellent noise isolation. Undoubtedly, these are the best-sounding V-MODA headphones I’ve ever used. I believe most people will love the rich sound, the clear mids, and adequate highs. I could enjoy the clear vocals and a wide soundstage on V-MODA headphones for the first time. The V-MODA Crossfade 2 Wireless is obviously the best V-MODA headphones on the market till now. This is an easy recommendation if you are a fan of the brand or you are looking for all-purpose wireless headphones that you can use every day. You can buy the Rose Gold version with aptX, it costs just $20 more but the audio quality over wireless connection is also better. The best V-MODA headphones ever.